littleBits Projects: Animatronic Hand with Arduino « Adafruit Industries – Makers, hackers, artists, designers and engineers! littleBits and Arduino have joined forces to give you the littleBits Arduino module. Tada! 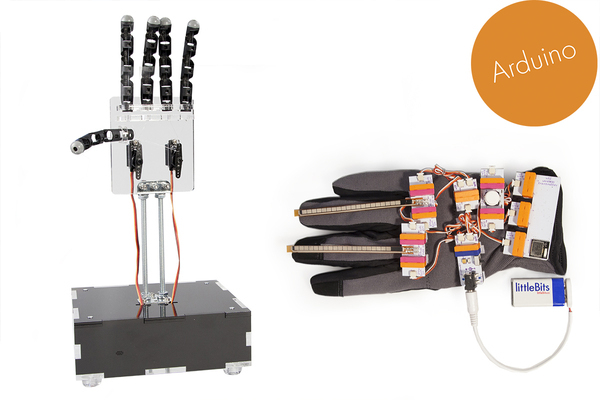 Now, with programming capabilities, you are able to create more complex interactions and advanced projects like this animatronic hand. Time for a good old game of Rock, Paper, Scissors! Can you beat this Watson-like Robot? 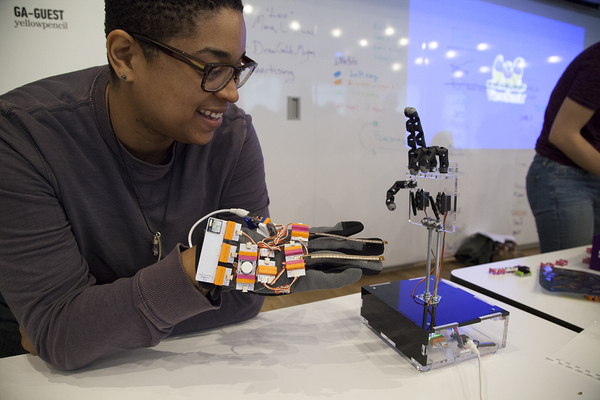 The hand is controlled by the littleBits Arduino module and programmed to randomly move into either rock, paper, or scissor position when prompted by you. This wireless interaction begins with a press of a button on the glove, where there are two bend sensors positioned on the second and third fingers. Given this placement, you get three different combinations of input signals from the bend sensors when you move your hand into one of the three options. When the button is pressed, a countdown begins. 1,2,3 shoot. Choose your hand position, and the animatronic hand will do the same. At this point, the Arduino module will compare the two hand positions and will be able to tell who wins, playing either a tune of victory or defeat. Talk to the hand! Make yours today. Find other littleBits + Arduino projects on the littleBits project page. New to Arduino? Check out the littleBits Arduino Starter Bundle. It’s all you need to get started programming with littleBits and the Arduino module!